Crowded opening event alongside Latvian pagan exile pagan representatives and sanctuary creation of the people involved was also attended by other ancient white dievest?bas common to both the Latvian and Lithuanian and Belarus, as well as the folklore group “curbs”, “Werewolves”, “Delve”, ” boat, “” torque “and” P?rkonieši “. “Monasteries and environmental objects layout vision developed by the pagan organization working group Valda Celma lead. Building architect is Ainars Markvarts, sculptor – J?nis Karlovs, room design authors – Andrejs Broks and Egons Garkl?vs, the costs incurred by the operator Dagnis ? ?kur, “reveals the organization’s representatives. Lokstene temple keeper of the Latvian Dievturu Sadraudze that combines ancient white dievest?bas successors contemporary Latvian. Sources tell me that the temple is on an island in the Daugava River. “Operator” Dagnis ? ?kur is a businessman who owns a group of bakeries and who paid for the temple. That is very traditional, if you think about it. In central and eastern Europe, and maybe elsewhere, there is a tradition to end a group hunt for deer, boar, and other animals with a ceremony. I have never seen the like in America, but then all my hunting has been with individualistic Westerners — which is not to say that sometimes informal rituals are not performed, but not with everyone lined up and flaming torches.1)Clifton’s Second Law of Religion: If there are no torchlight processions, it’s not a real religion. At last in Latvia we now have a chance to make lady hunters more pro-active. And we had the chance to organise first ever in Latvia a driven hunt for ladies – ladies are shooting, guys are helping. Now we are in the process of creating our own Lady hunting club under Latvian Hunters’ Association. Watch and you’ll see lots of tramping in the snowy woods, but right at the end — wow. That’s an altar, folks. Folk-memory or reconstruction, they are tapping into Old Stuff. I suspect that they know what they are doing. 1. ↑ Clifton’s Second Law of Religion: If there are no torchlight processions, it’s not a real religion. I have been feeling the energy boost from more sunlight, but I live at just past 38° north, whereas Riga, Latvia’s capital, is at almost 57° north. So even the “shortest night” is longer here. Jekabs Bine (1895–1955) “Perkons (Thunder),” 1941. Oil on canvas, 53 x 65 cm. The Janis Rozentals Saldus History and Art Museum, Latvia. The next issue of The Pomegranate will include a special section on the revival of Paganism in Latvia, a revival that blossomed in that Baltic nation’s first period of independence, 1917–1940, or between the Russian Revolution, which released Latvia from the old empire, and the beginnings of World War II, when the small nation was scooped up first Soviet Union, then by the Third Reich and then by the Soviet Union again, a crushing embrace that lasted until 1991. 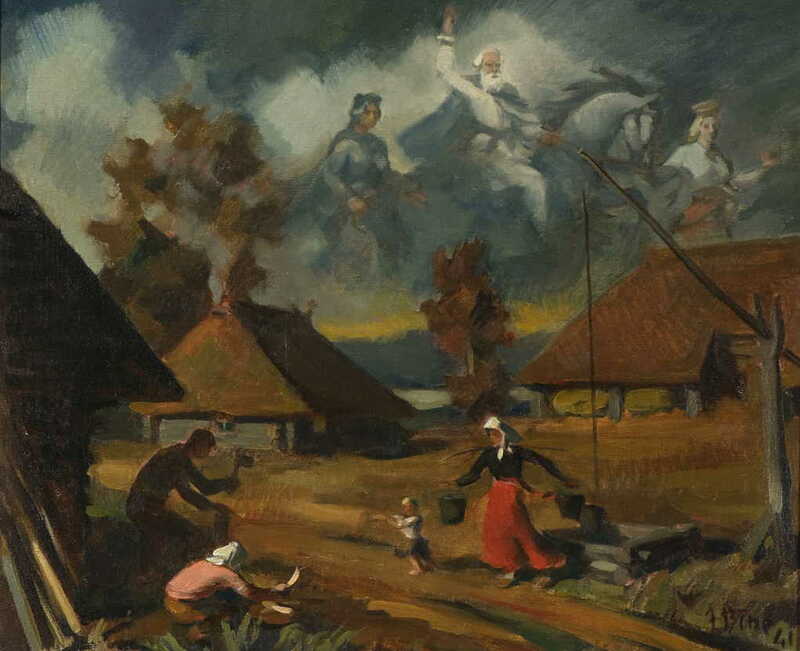 I was partway through layout on an article by the Latvian art historian Kristine Ogle on Pagan themes in Latvian art before World War II, when M. came in from the veranda, saying that she could hear the emergency siren from down the valley. Drop editor persona, assume volunteer firefighter persona. Over my clothes I put on my “wildland interface” jacket and pants, since the sheriff’s dispatcher was saying this was a report of smoke, not a structure fire. I grabbed pack, radio, helmet, and was off, soon to be driving one of our brush trucks (wildland engines) up a county road that might lead to the site. But nothing. Eventually we ended up with another firefighter and me in the brush truck, two more following in personal vehicles, a sheriff’s deputy, and an engine from the Bureau of Land Management. We split up to investigate different muddy ranch roads — still nothing. So after an hour, we called it off. It had already hailed briefly in the morning, and soon after I came home, another little thunderstorm went through. So it seemed reasonable not to worry too much, not this week. People are still jumpy after the fire last October that took out 15 houses near mine—a wisp of low-hanging cloud might have looked like smoke. Back at my computer, I continued where I had left off on the article. I had been just about to place a graphic in the file, and you can see it up above — the god of thunder. Thunder has been much in evidence today here in the Wet Mountains, but given the painting’s date, you have to wonder if the dark clouds over the peaceful Latvian farmstead were more than thunderheads. The next issue of The Pomegranate: The International Journal of Pagan Studies will be devoted largely to new forms of Paganism in the Baltic countries, if all goes as planned. This movement itself started in the 1920s—and promptly fissioned. (Insert “Peoples’ Front of Judea” joke here.) But that origin does make it an old-timer in contemporary Paganism. Latvia gained its independence in 1919, following the collapse of czarist Russia and Latvia’s own factional war. It became a republic, but a politician named Karlis Ulmanis dissolved Parliament and seized power in a bloodless coup in 1934. His authoritarian nationalist government lasted until the Soviet Union occupied Latvia in 1940. During that time, however, the political police were spying on all political, dissident, and unusual groups, including the Pagans. I don’t want to steal Prof. Anita Stasulane’s thunder, but she made an interesting discovery in the national archives: notes on Pagan meetings and rituals made by a police “mole” in the group. There is so much there: who attended the meeting, what was talked about, what songs were sung, how the altar was decorated . . . Imagine, for example, if someone had infiltrated that Yeshua ben Yusef’s group two thousand years ago — and that the scrolls had survived and been re-discovered. New Testament studies would sure look a lot different.